“Les Mis” fans – lucky you! Russell Crowe charms us once again, albeit briefly, with his canary-like singing voice as Noah in Darren Aronofsky’s latest studio production. The film is the center of quite a bit of controversy, but whatever you think you should expect, you’re wrong. Several elements totally surprised me - even the opening credit font was an indicator that this was going to be a very different and unique interpretation of the story. As Noah’s wife, Jennifer Connelly has about 5 lines in the entire movie, but is strikingly beautiful and strong in her silences. She doesn’t appear to age at all, while Noah goes through about every hairstyle and color in the book. The landscape of the film reminds me of Crowe's “Robin Hood,” and the score soars. 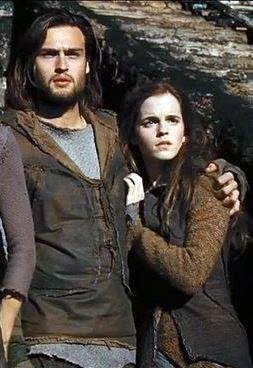 Emma Watson has more emotionally gut-wrenching scenes than anyone in the film, and my new celebrity crush, Douglas Booth, plays Noah's son who falls for her. I can see why these two have no trouble re-populating the Earth. Shout out to Sir Anthony Hopkins, who nails his role as the cooky medicine man grandfather. All animals are CGI (computer-generated), but that doesn’t lessen the effect. If you’re a fan of director Darren Aronofsky (which I’m NOT), you will probably hate this film, as it’s not the creepy, nightmare-enducing “Requiem for a Dream,” “Pi” or “Black Swan.” It was much tamer, with as much emotion as action, though perhaps a bit too much dialogue. The film provides reasonable answers for a lot of questions – how could he possibly build that ark alone? How were there enough people to re-populate the Earth? – and is a far-stretched but believable interpretation of the story. The flood can't come soon enough, but there are some spectacular visual moments.